One of the first times I used my smoker, I made meatballs. They turned out awful. In fact, awful might not even be the right word. What is worse than awful? That’s what those meatballs were. I thought I had followed the meatball recipe to a T, but unfortunately, they turned out to be too salty. Those meatballs were so salty that it would have been refreshing to drink water out of the Great Salt Lake after taking a bite of meatball. I’ve learned a few things since then, and after that experience, I don’t mess up my salt ratios. 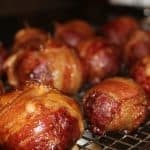 I’ve made meatballs a few times since that awful dining experience and today, I am going to share my favorite smoked meatball recipe with you. These meatballs have great flavor, and as long as you follow the recipe, I’m certain your friends and family will love them. This meatball recipe can be cooked as an appetizer, or you could serve the meatballs as the main course. My family loves these meatballs, and I’m sure you will too. This meatball recipe is simple and only requires a few ingredients to get started. I’ve made these a few different ways, and my favorite combo of meat is a 50/50 ratio of ground beef, and ground Italian sausage. I’ve also made this meatball recipe with regular pork sausage instead of Italian sausage, but I like the added flavor the Italian sausage provides. I follow a ketogenic diet most of the time, so I also wanted to find a good meat combo that would allow me to forgo the usual addition of flour or breadcrumbs that is common in many meatball recipes. The fat content in the sausage helps hold everything together. A pound of ground beef and a pound of sausage will be enough to make 8 meatballs. 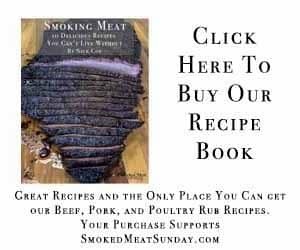 I also add a half tablespoon of paprika, a half tablespoon of kosher salt, and a quarter tablespoon of black pepper to the meat. Combine the meat and seasoning with your hands in a large bowl, and then set it off to the side. We could just add an egg to the meat mixture, form some balls, and call it good, but that’s boring. This meatball recipe is not boring. That being said… add one egg to the meat mixture. Once you’re done playing with the meat, grab an 8 oz block of cheddar cheese, and cut it into 8 equal sized cubes. Now, thinly slice two jalapenos. You can remove the seeds from the jalapenos if you’d like. I’ve tried this meatball recipe both ways, and I can tell you I appreciated the added heat the seeds brought. I’ll let you make the call, but don’t say I didn’t warn you. While we are slicing, we might as well grab a pound of bacon, and slice the bacon pieces in half. This meatball recipe isn’t boring, remember? Speaking of Bacon… before you go, check out my favorite way to cook bacon. When you’re done slicing and dicing all your ingredients, it’s time to form your meatballs. Lay a large piece of wax paper out and divide your meat mixture into eight equal sized balls and place them on the wax paper. Once you’re done forming the balls flatten them out onto the wax paper. Flattening the balls makes it easy to add your jalapeno and cheese. Add a few slices of jalapeno and one cheese cube to the top of each meat patty, and then pull up the sides of the meat and seal the top. 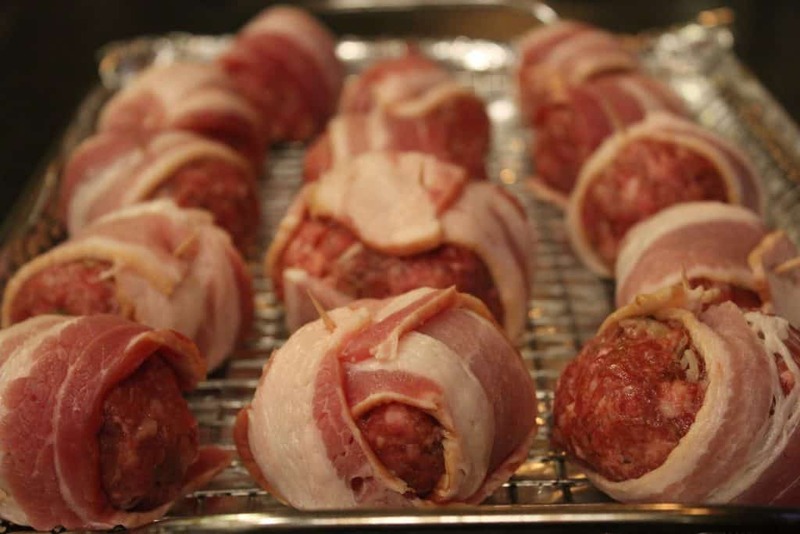 After you’ve formed all the meatballs the last step is to wrap each meatball with a few slices of bacon. I like to wrap one slice, and then wrap another perpendicular to your first piece to give full coverage. Push a toothpick through the meatball and bacon to hold it all together. One side note here; don’t use colored toothpicks! The colored toothpicks will bleed into the meat, and I’m pretty sure that dye isn’t something you want to eat. When you’re making meatballs, don’t use colored toothpicks! Now that all your meatballs are wrapped and ready, the last step is to transport them over to your grilling rack and put them in the smoker. Before you put the meatballs in the smoker set your temp to 225 degrees. 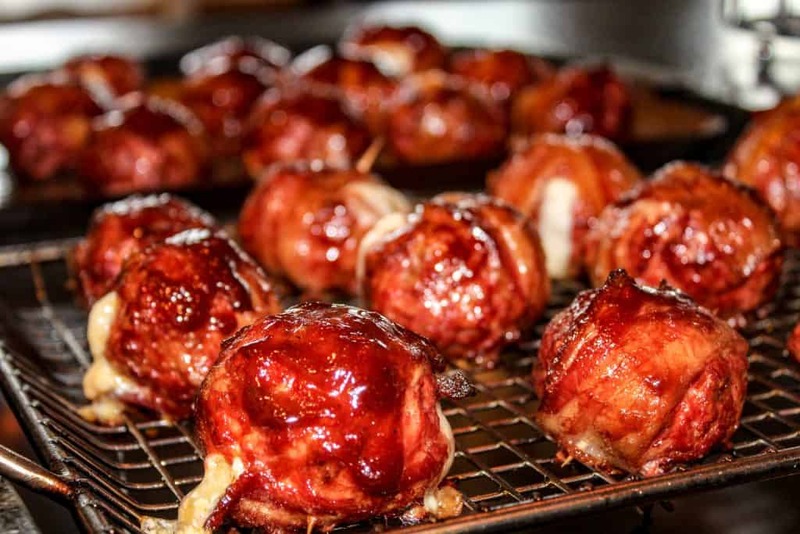 You’ll want to cook your meatballs at 225 degrees for about an hour. After an hour, turn the heat up to 350 and cook until the bacon starts to crisp up. You want to cook these meatballs until the internal temp of each one is 160 degrees. I use a Thermapen Mk4 to check internal temperatures and I love it. This grilling gadget is worth the investment! When your meatballs are up to temp, remove them from the smoker, and let them rest for about five minutes. This allows the cheese inside each meatball to settle down a little bit before you slice into them. If you slice right away, you could have a cheese explosion! These meatballs are delicious on their own, or you can dip them in your favorite barbecue sauce. Stuffed meatballs are definitely not a new idea. I hope you like my take on them. If you’ve made stuffed meatballs before, I’d love to hear what you do differently! Let me know in the comments below. One of the first times I used my smoker, I made meatballs. They turned out awful. In fact, awful might not even be the right word. What is worse than awful? That’s what those meatballs were. I thought I had followed the meatball recipe to a T, but unfortunately, they turned out to be too salty. Those meatballs were so salty that it would have been refreshing to drink water out of the Great Salt Lake after taking a bite of meatball. I’ve learned a few things since then, and after that experience, I don’t mess up my salt ratios. 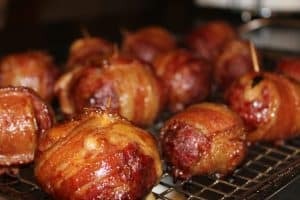 I’ve made meatballs a few times since that awful dining experience and today, I am going to share my favorite smoked meatball recipe with you. Combine the meat, seasoning, and egg with your hands in a large bowl, and then set it off to the side. Cube the cheese into 8 equal portions. Thinly slice two jalapenos. You can remove the seeds from the jalapenos if you’d like. I’ve tried this meatball recipe both ways, and I can tell you I appreciated the added heat the seeds bring. I’ll let you make the call, but don’t say I didn’t warn you. Lay a large piece of wax paper out and divide your meat mixture into eight equal sized balls and place them on the wax paper. Once you’re done forming the balls flatten them out onto the wax paper. 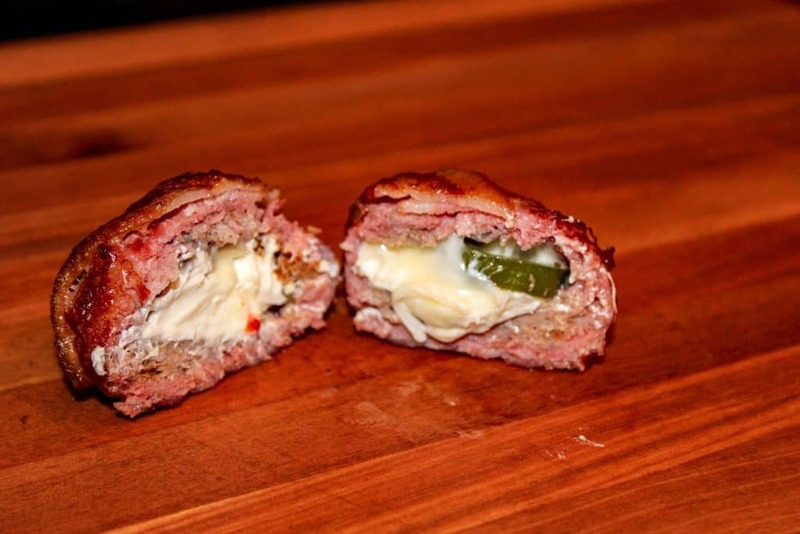 Flattening the balls makes it easy to add your jalapeno and cheese. Add a few slices of jalapeno and one cheese cube to the top of each meat patty, and then pull up the sides of the meat and seal the top. 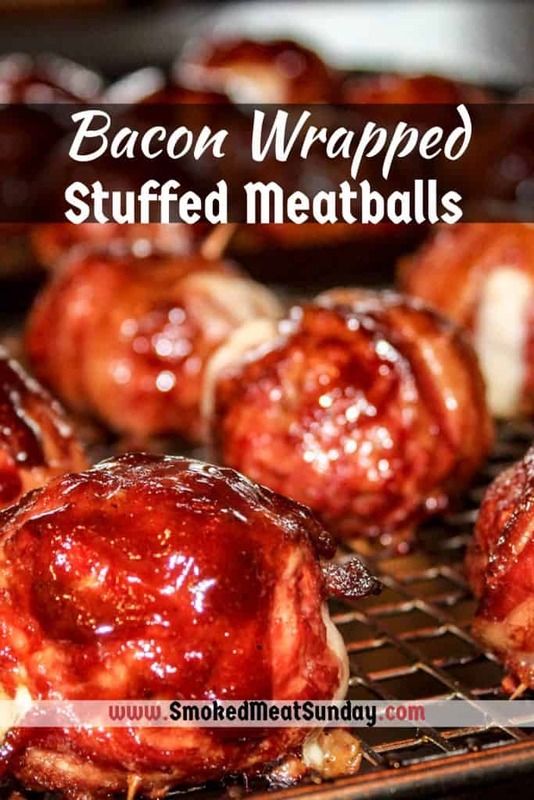 Wrap each meatball with a few slices of bacon. I like to wrap one slice, and then wrap another perpendicular to your first piece to give full coverage. Push a toothpick through the meatball and bacon to hold it all together. Transport the constructed meatballs over to your grilling rack and put them in the smoker. Before you put the meatballs in the smoker set your temp to 225 degrees. Cook your meatballs at 225 degrees for about an hour. You want to cook these meatballs until the internal temp of each one is 160 degrees. I use a Thermapen Mk4 to check internal temperatures and I love it. 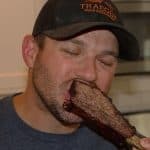 This grilling gadget is worth the investment! When your meatballs are up to temp, remove them from the smoker, and let them rest for about five minutes.